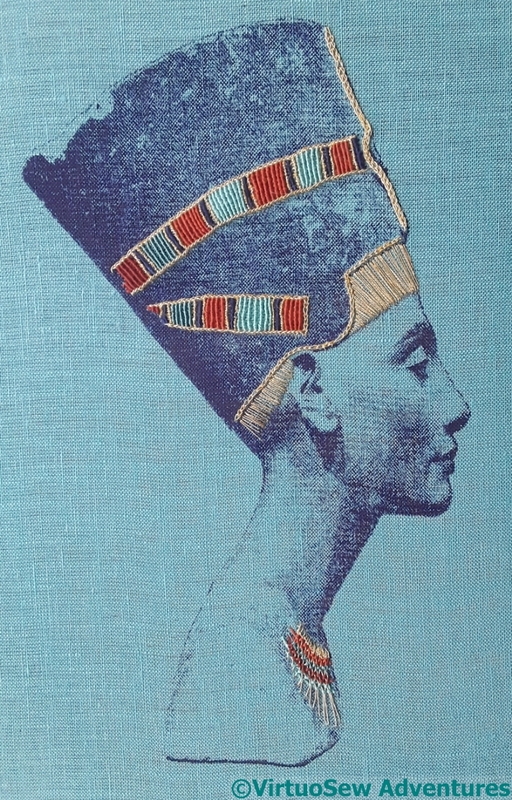 Unless I decide otherwise, the head of Nefertiti is now finished. 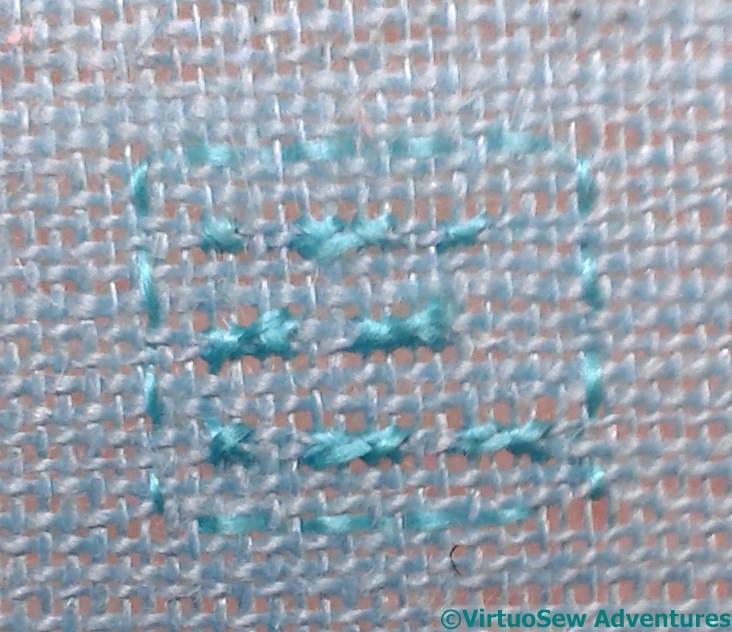 I’ve worked my Morse Code cartouche slightly differently this time, using cross stitch for the dots, long armed cross stitch for the dashes, and counted running stitch for the frame. This works rather well, so it’s a possibility for any eventual canvaswork projects in the future. 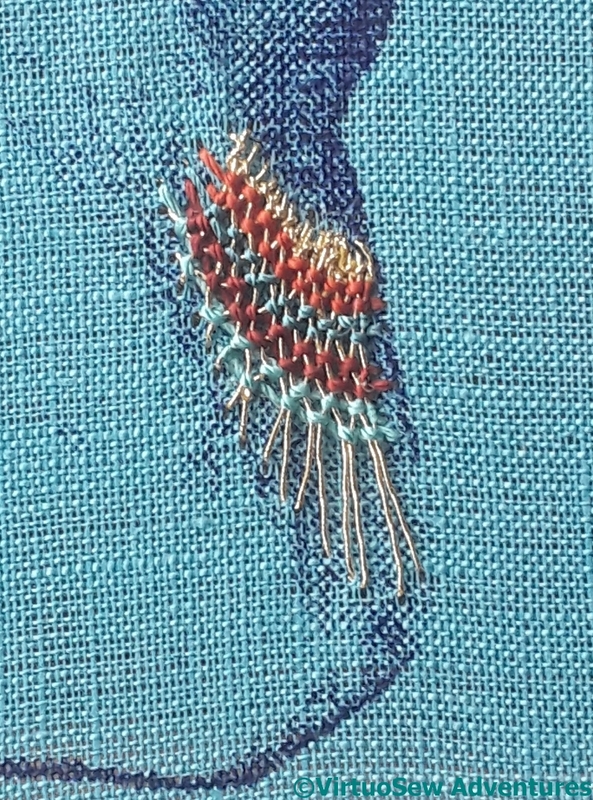 However, in this instance it is almost completely invisible, so I may yet unpick it and rework it twice the size, with four threads in each direction instead of two. 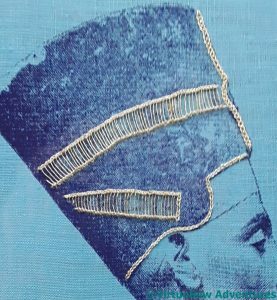 In the end, if you recall, I decided to work Nefertiti’s cartouche, both the hieroglyphs and the frame, in reverse chain stitch using untwisted silk. 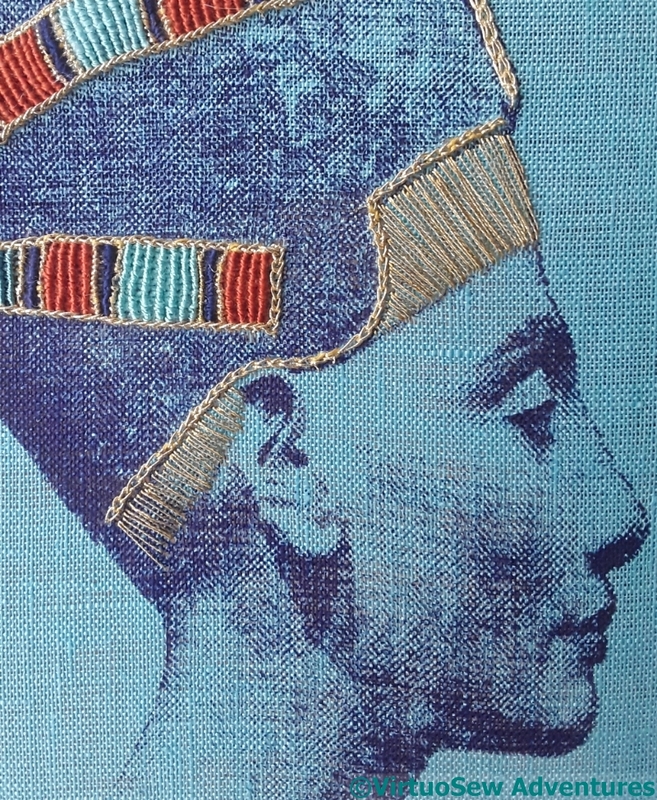 The rays of the Aten are worked in reverse chain stitch, but using hand twisted silk. I am a little concerned about balance and the strength of the design, but when I was playing with my photos of of the finished panel, I noticed that when I cropped the picture closely, rather than including all of the length I have stitched of the rays of the Aten, it was much improved. That happened with the Camberwell Panel, and with Loading the Felucca, as well, so I shouldn’t be surprised. 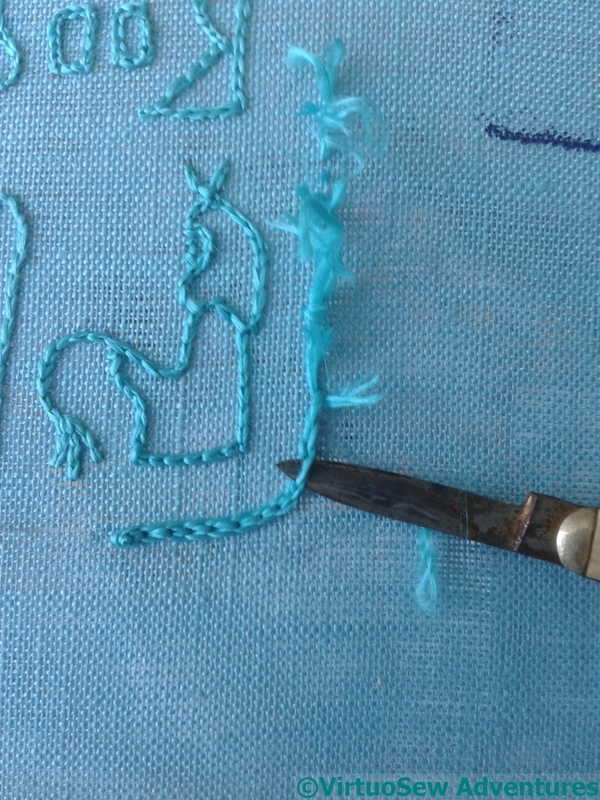 And I really should remember to play with that sort of detail when I am mounting and finishing my embroideries! There were many false starts when I came to work on the cartouche. 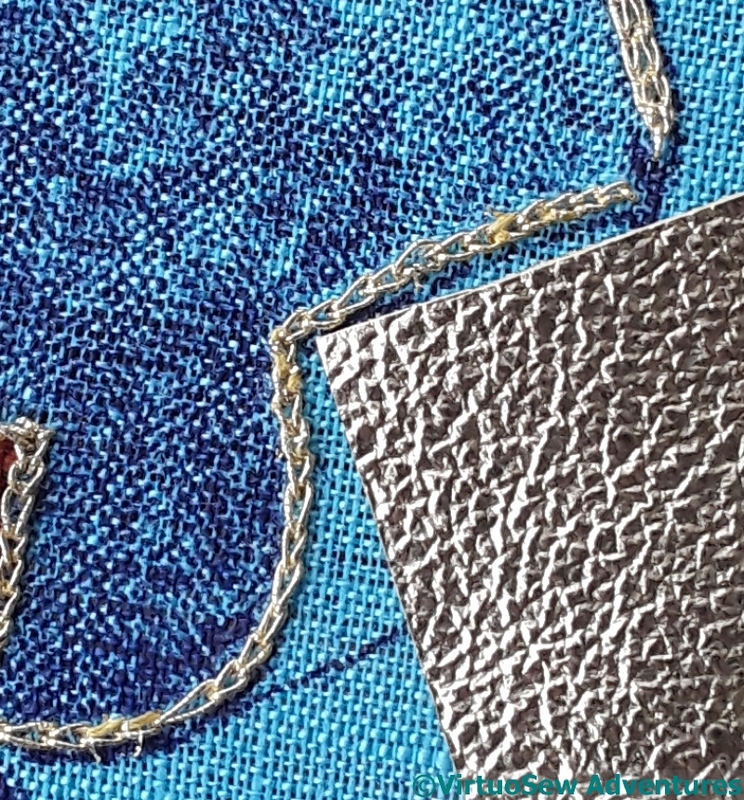 The fabric is under such tension, in order to work the metal and silk stitches, that it’s hard not to create something that looks very fragile and wispy. 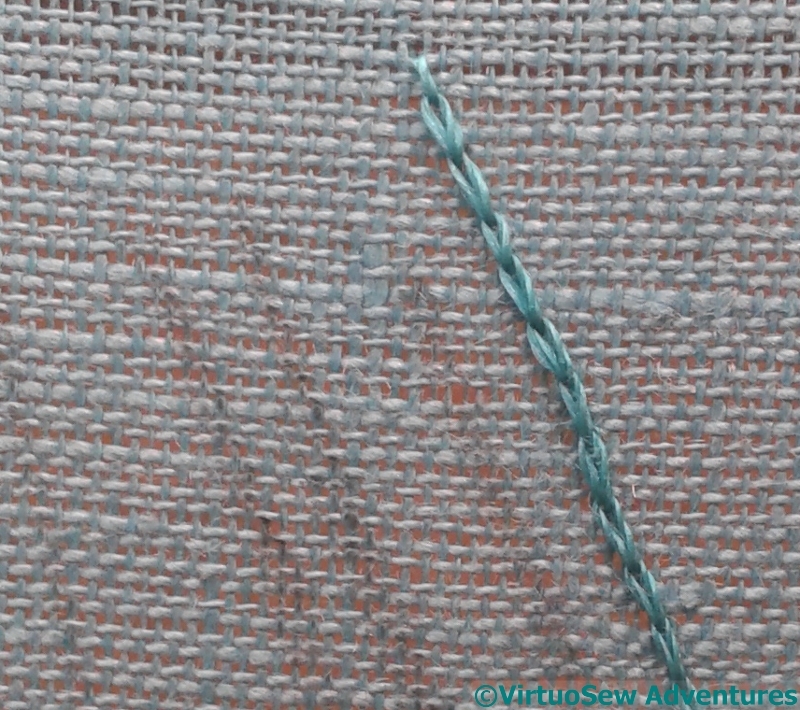 Here you see stem stitches, back stitches, straight stitches, chain stitches of different lengths, some worked using the same twisted thread I used for the rays of the Aten, and some in untwisted thread of the same thickness. And I didn’t like any of them. 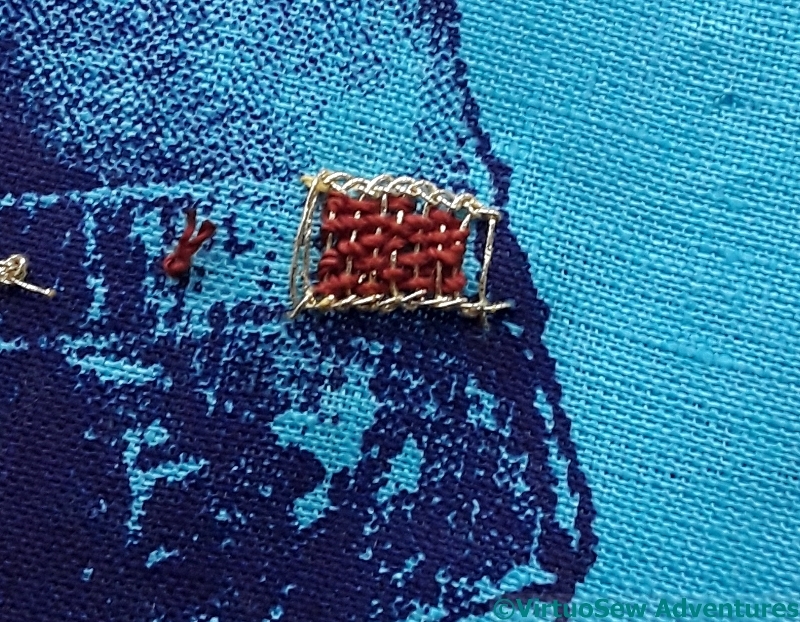 In fact, I ended up doubling the thickness of the thread, but not actually twisting it. This creates a more definite line, and using reverse chain stitch throughout maintains the sense of continuity with the rays of the Aten. Once I had finished the hieroglyphs, I had to work the frame of the cartouche, and guess what – false starts here as well. 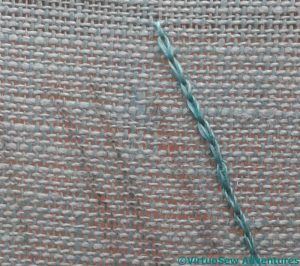 I was rather saddened that among the stitches tried was one of my favourites, Hungarian Braided Chain Stitch, and that, like several others, ended up being sliced out with a penknife. A rather nice penknife with a mother of pearl handle, from a vintage sewing set, but it’s frustrating to dismiss a favourite stitch, even when it’s because you don’t think it works in the context. After much to-ing and fro-ing, and a good few “ouches” from my recalcitrant sub-scapularis muscle, I finally got the cartouche finished. I’m not entirely sure I like the finished result, so it is sitting in the living room, being stared at. 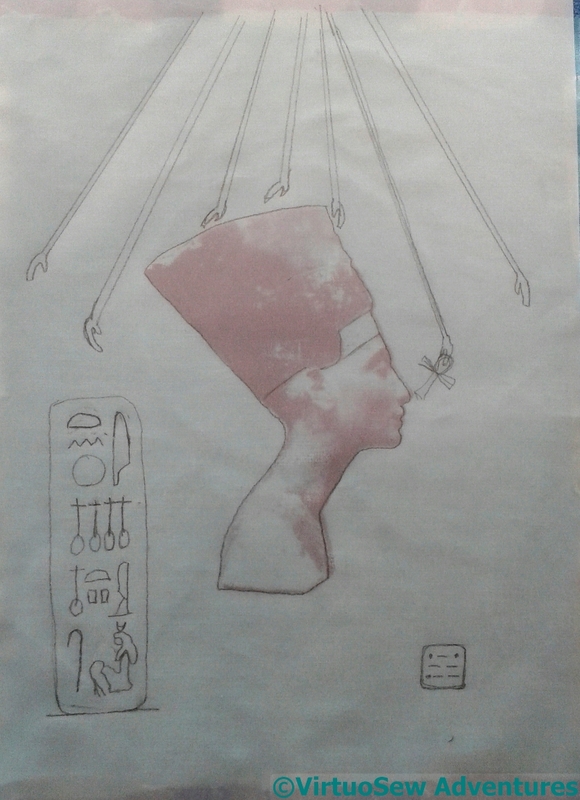 I suddenly realised that I haven’t got any representations of the Aten in the panels. 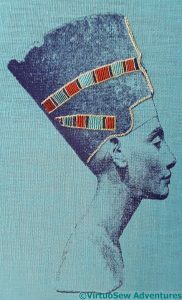 Considering that Akhenaten’s new, monotheistic devotion to the Aten actually created Amarna (Aketaten in his day), that is more than a little remiss of me. So the extra details I am planning for Nefertiti – shown here, drafted on tracing paper laid over the the print I didn’t use for stitching – begin to right that wrong. I’ve drawn the rays of the Aten ending in little hands outstretched in blessing, as seen in many wall-carvings and paintings at Amarna. For some reason (research to be done…!) 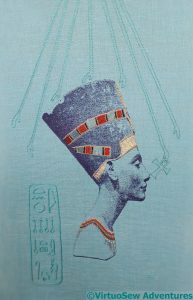 the hands nearest the noses of Nefertiti and Akhenaten often hold an ankh, so that is also included. I’ve added in Nefertiti’s cartouche, although I think I may have drawn it too large for the design as a whole, and my own, which will include my initials in Morse Code, as this is a standalone companion piece. 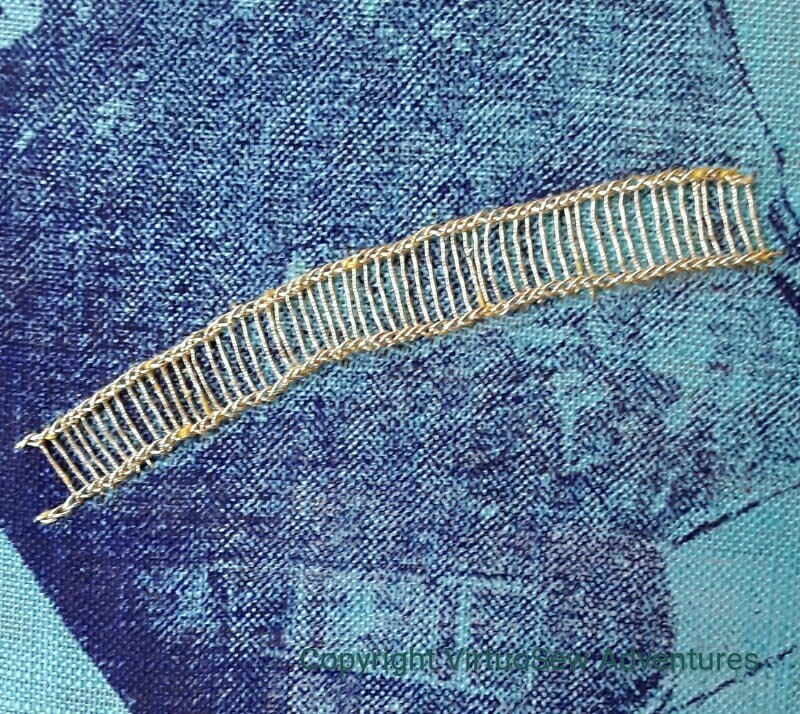 I want the lines to be there, and yet not there, so I found some filament silk that I bought at Texere Yarns before they closed their store, and had a go with it, using reverse herringbone stitch, as I did for the contours of The Map of Amarna. 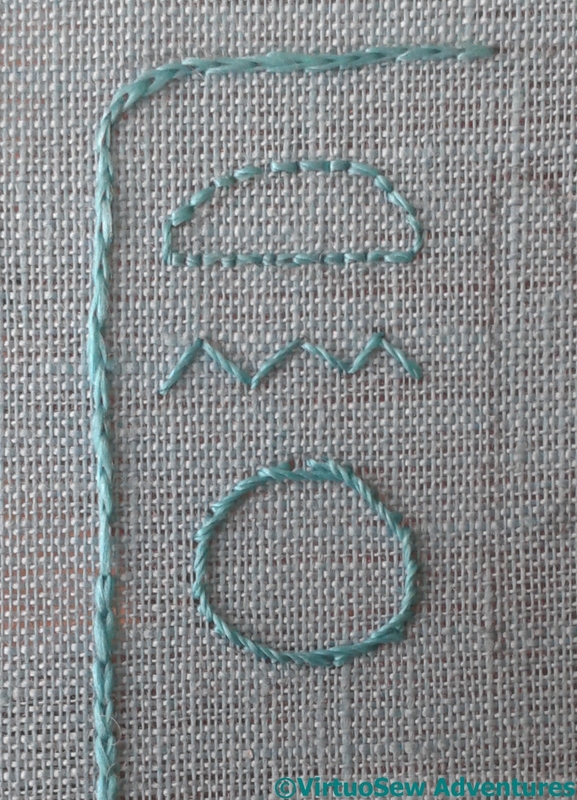 So this is the next version, reverse chain stitch using a 2-into-1 twist. I’m much happier with that, although twisting the thread before I stitch with it does rather slow down the stitching part of it! But still, here I am, stitching with hand-twisted thread, twisted by me. Never would fifteen-year-old me have believed I would be doing that! If my Grandmama could see me now…. 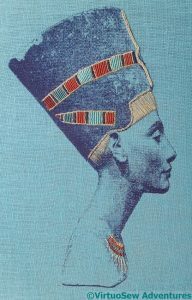 So this is where we left the Head of Nefertiti. the polychrome bands and the gold edges of the headdress are done, and I have worked a section of necklace. I keep flip-flopping between feeling that that section of necklace is just right, and feeling that it really isn’t enough at all. I like the sense of a delicate flash of colour barely surviving the years, but at the same time, there’s an inner glitter-girl that wants to see a bit more than that.. So, while I think a little more about the necklace question, I thought I’d make another attempt at the browband. 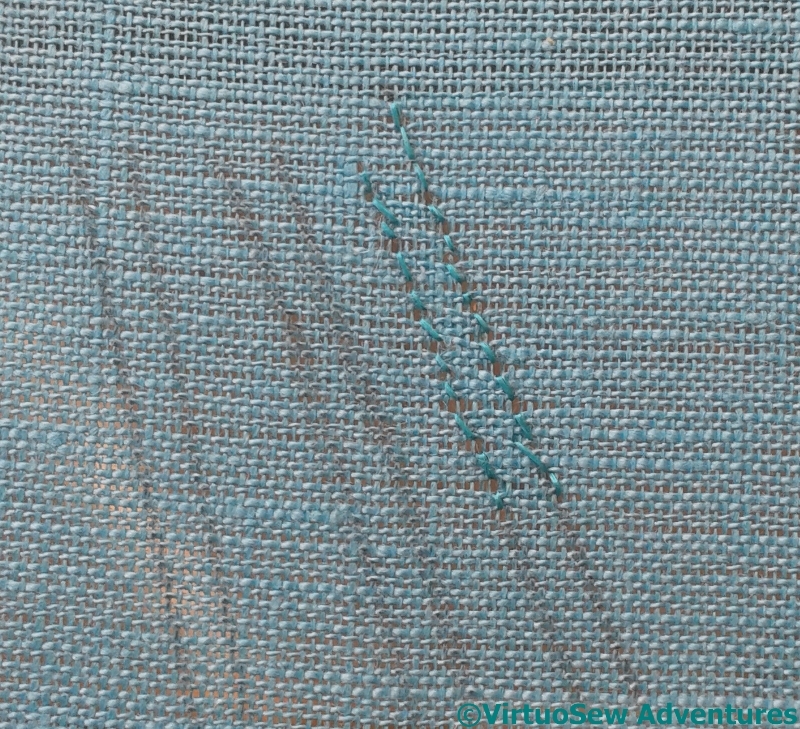 This time it is simply straight stitches, in a slightly finer thread than the rest of the gold stitching. It’s not perfectly regular, but, again, the slight unevenness evokes the damage of the years. 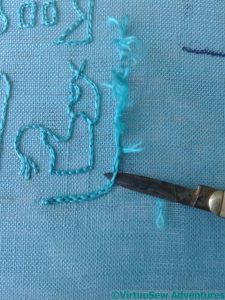 And besides, by now, you must know that regularity of stitching is not my forte! So, again, I find myself at a pause. I’m happy with the browband, I think, definitely happy with the polychrome bands, and the gold trim. However, I’m still not sure whether I’m happy with the necklace. Since my thought is to quilt a pattern into the background, I had best be certain that I’m happy before I start attaching padding and picking patterns! Once I had finished the polychrome bands, I sat back and looked at them. Using the darker shades of the colours in the darker part of the print helps to tie it all together and wrap the bands around the headdress. I had a moment or two of concern, then decided that I would not, after all, ruin everything if I continued to add the other elements of the design that I had planned. There is always a moment or two of fear, especially when an early section has gone well! The original bust shows something that looks like a browband of gold, fairly plain and flat. I fished out a piece of gold kid, but although the photograph doesn’t show it very well, the kid is the wrong colour (too pale, and not yellow enough) for the gold thread, so I have to think of something else. Meanwhile, I thought I would experiment with the necklace, or collar. My thought was that, rather than do the whole thing, I would do a small section of it, to make sure that I maintain the feeling of an embroidery, and not a portrait of a portrait. 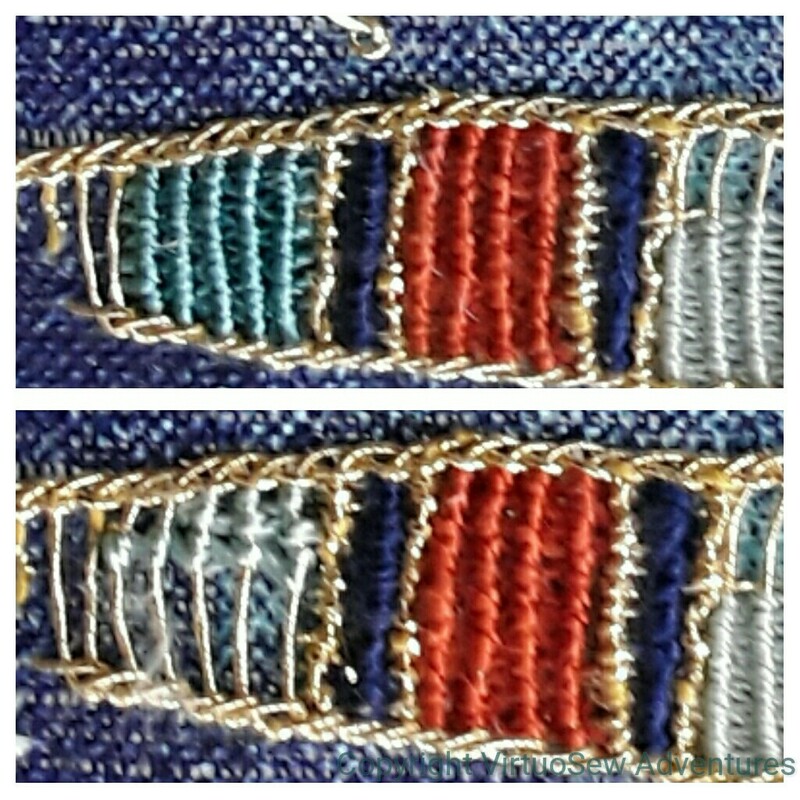 What I have done here is to make radiating stitches of the gold thread, and then use the same whipped filling stitch I used on the polychrome bands, but alternating them so there is a hint of a gold net underlying the collar. I like this, but maybe I do need to do an entire collar’s worth. You will recall that I was rather underwhelmed by the effect of my first attempt at weaving the silk into the gold. Leaving the threads loosely packed to allow the gold to show through allows them to look untidy, and the colour is somehow a little flattened, not the rich, strong colour I wanted. So I decided to work the whipped style of filling stitch instead. It creates a strong colour, something like a grosgrain ribbon, in fact. 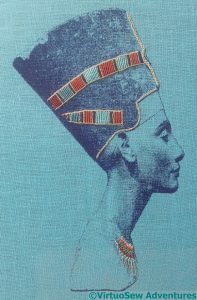 I’m using primarily colours from the Mulberry Silks “Nefertiti” colour range (appropriate, don’t you think! ), and I’m happy with the rusty red. The navy is actually a heavy perle type and I’m not sure where it came from. That works too. The lightest colour, however, on the far right, is too fine. It produces too retiring an effect, and weakens the whole effect. 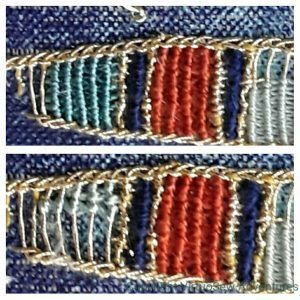 So I tried one of the stranded silks from Thistle Threads (lower example, left), and wasn’t convinced by that, either. This looks better. In fact the two light blue-greens are different, although that isn’t as clear in this photo as I might have liked. They aren’t as green as I would have liked, but I’m reasonably happy. 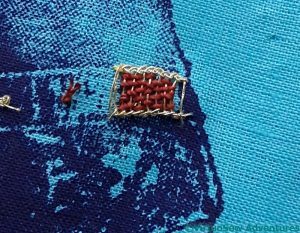 If I decide to redo them, I may have to redo the whole thing, as the unpicking earlier on has left the Ladder Stitch a bit floppy. 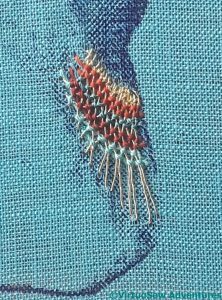 There are small elements of goldwork which I am planning to work last, but most of it, I wanted to put in place first, so that I can be sure that the whole thing remains in balance. 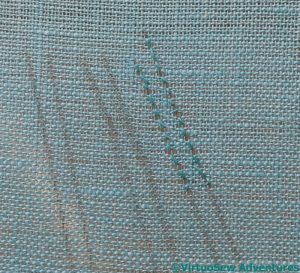 As I’ve mentioned, the framework for the silk is in Ladder Stitch – the whole of the first section redone, as I threatened. 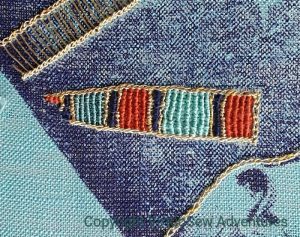 The narrow line around the base is in reverse chain stitch (much easier to work in a frame than the ordinary chain stitch). The coloured bust suggests a gilded inner section for the headdress, and I have yet to decide how to represent that. Maybe gold kid? The ornament on the front of the headdress looks rather heavier and thicker than the other lines, so I’ve worked it in Hungarian Braided Chain Stitch. 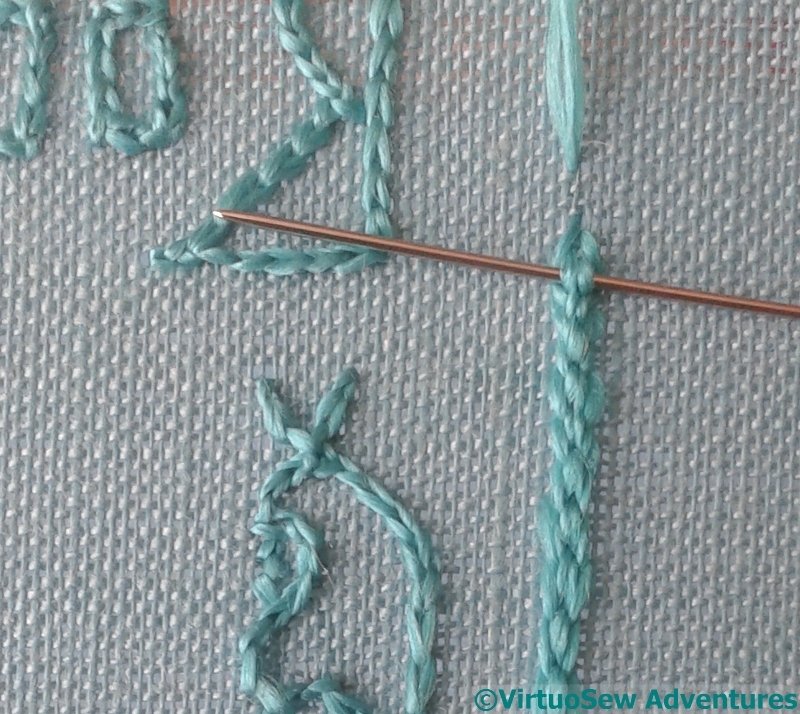 I’m a little disappointed with it at present, and wondering whether I need to pick a still heavier stitch – such as the dreaded (not any more!) 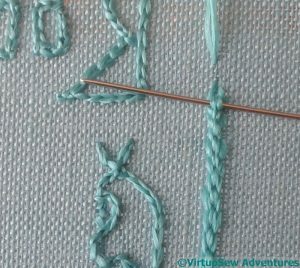 Plaited Braid Stitch. I’ll decide, I think, when I’ve completed the rest of it. So, on to the silkwork. I had a previous, failed print to experiment with, and I’m just as glad I did. 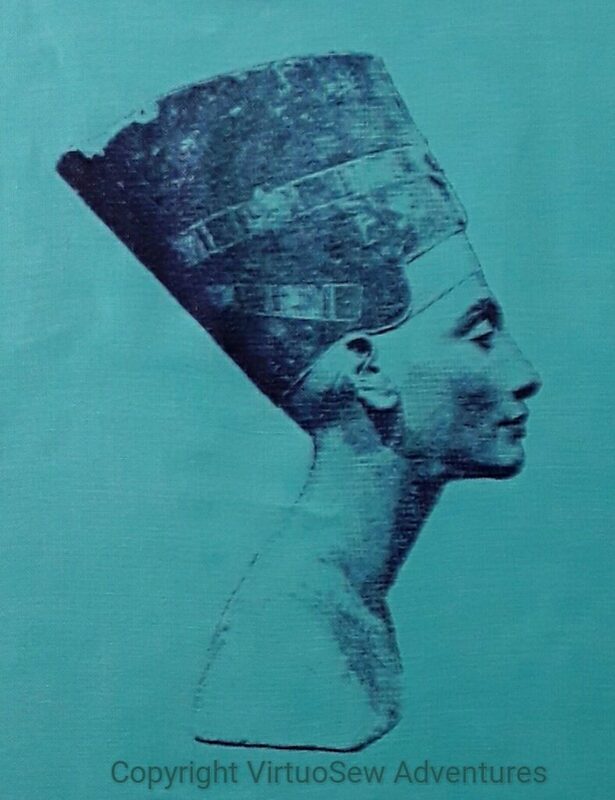 This is much the best print I’ve managed of Nefertiti, pressure, speed and amount of ink all working nicely, and very few really dark sections. 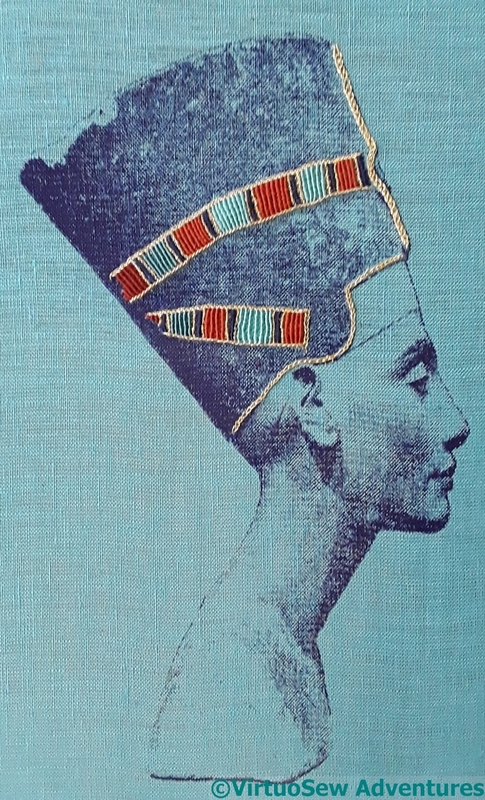 What I want to do now is to highlight the coloured elements of the crown she wears – unique to her, apparently, no-one else in ancient Egypt has ever been depicted wearing it. I’ve got some gorgeous silk threads from Mulberry Silks which should do the job perfectly, but first they need a skeleton of gold. I had a lovely rummage in among the assorted wonders I’ve received from Thistle Threads (they have their own special box, of course), and after staring critically at the linen fabric, picked out the Special Tambour, and made a start. 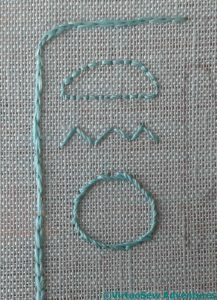 My idea is to create a framework of Ladder Stitch, and then add colour – as in the Tudor Rose project – using silk threads. 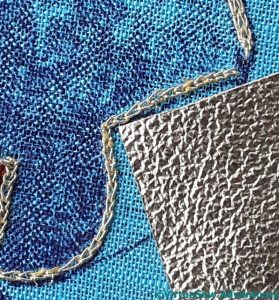 Long term readers may recall that during the Tudor and Stuart Goldwork Masterclass, I had some trouble with Ladder stitch, so although I was fairly sure the idea would work, I sat down with some trepidation. To be very pleasantly surprised. 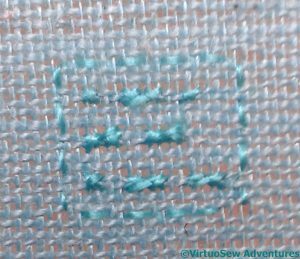 Something has happened in the intervening few years, and my ladder stitch wasn’t as trying as I expected, and moved fairly swiftly, too. I may yet decide to redo the stitches, because I re-tightened the fabric in the frame about halfway across, but that will depend upon how much better the second section looks when I have done it. That’s a good start to a new project, isn’t it!